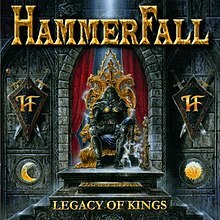 Legacy of Kings is the second album created by the Swedish metal band HammerFall. It was released on September 28, 1998, by Nuclear Blast Records. The enhanced CD release includes the music video for the track "Let the Hammer Fall", a photo gallery, lyrics for the songs, PC wallpapers, a screensaver, and a Winamp skin only on the Bonus Deluxe Edition. The cover art for this album was painted by Andreas Marschall. Legacy of Kings Box (limited box which contains CD of Legacy of Kings, personalized pick, Heeding The Call sticker and signed cards of each member. ), LP, Shape CD (Sun-Shaped), Picture LP, Value Box (With "Always Will Be" CDS) and Deluxe Edition. All versions contain the songs from #1 to #10, excepted the ones listed below. The Japanese release contains "Eternal Dark", Stone Cold" and "Steel Meets Steel" as bonus tracks, plus the enhanced part. The Brazilian release contains "I Want Out" as bonus track. Deluxe Edition contains "The Metal Age" and "Steel Meets Steel" (both recorded live) as bonus tracks. There is a limited version that includes all four tracks from the "Always Will Be" single as bonus tracks. There is also a re-release of the album which contains a videoclip for "Let the Hammer Fall", and two additional live tracks: "The Metal Age" and "Steel Meets Steel". This page was last edited on 2 November 2018, at 23:52 (UTC).